It’s taken me a long time, but I finally have a ‘system’ that has made inhaled treatments easier to keep up with. In childhood, I was very compliant with the CF treatments, as my parents helped me. I didn’t need to think about it; it just happened. 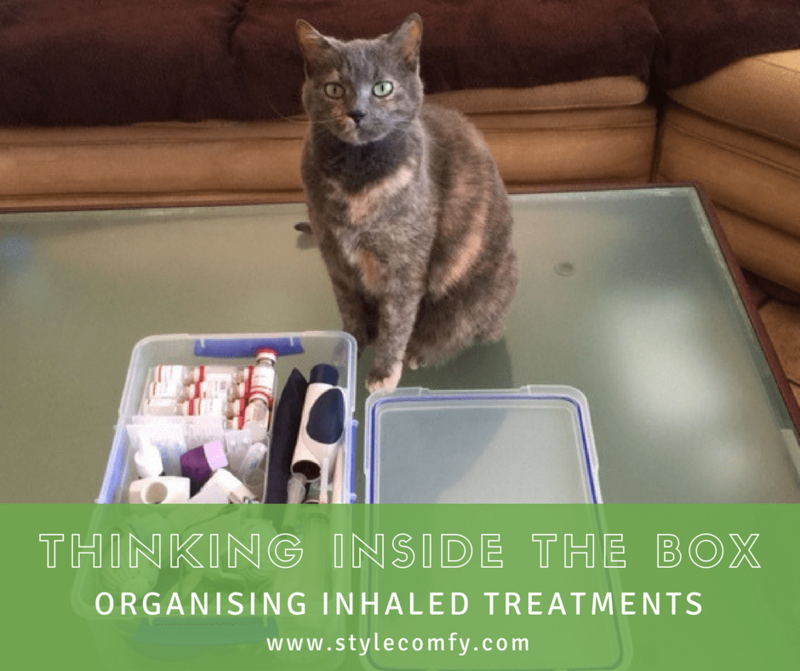 In my late teens and twenties, I started slacking in what I assume was a normal rebellious phase along the lines of ‘Does this stuff even work?’ I switched to inhalers as needed and skipped anything I couldn’t feel a benefit from. I exercised actively during those years so I justified that I was doing a lot of ‘treatments’. I’m sure it helped, but of course it was no substitute and it would have been wise to add the exercise along with everything else and not instead. My doctors advised to stick to all the prescribed regimens including Nebuliser treatments! Physio! Twice a day! Forever!…And for the record, if I could go back in time I would do everything I can to stay healthy and limit lung damage. Just so we are clear: doing treatments to the best of your ability even though you feel healthy: smart. Slacking off because you can’t see the big picture: not smart. Over the years and with some lung function decline, I have increased treatments from a few times a week to daily, but still battled to do them twice as day as prescribed. It felt like such a buzz kill, life was busy and having to accommodate seven extra sets of treatments a week when I already had my plate full with deadlines and tiredness and a hundred other things, felt impossible. After routine IVs earlier this year I emerged feeling fantastic. This time I was going to keep it up and be 100% compliant. After a few days at home, it became harder to do the treatments again. It took so much willpower. My eflow was malfunctioning and only worked via the power cable so I had to sit next to a power outlet, or coax it into working with batteries. I always had to fetch random meds from everywhere in the house, and carry stuff from room to room and then tidy up afterwards. There was neb paraphernalia everywhere and it was getting to me. I needed a system or this was never going to work. Previously, I had a slow compressor and my eflow was giving me hassles so I ordered a new eflow unit which works great, and with batteries. I have 8 good rechargeable batteries which I use on rotation. Whatever type of nebuliser unit you prefer, I think it is worthwhile to spend money — even out of pocket if necessary — to upgrade, service, and replace the consumable parts regularly so your device works like it should. Having a frustrating device that takes too long, makes compliance even harder. Can see a week ahead if I have enough meds. Has a lid that seals, so everything stays dust-free and can be kept away from cat and dog hair. When the lid is off, I use the inside of the lid it as a clean tray to prep stuff on. This seems silly but it’s one of the my favourite things. Everything fits: neb parts, ampules, nasules, inhalers, nasal sprays, stuff for mixing the antibiotics, charged batteries. NOTE: get a box bigger than you think you’ll need. This one does a good job, but a little more space would’ve been better. In inches my box is approximately W9.5″ x L14″ x H4.7”…or in metric W24cm x L35cm x H12cm. It requires minimum ‘decision energy’. Instead of performing several steps before even starting the treatment, I only need to open the box. Everything is already there. I have a large tote bag that the box fits in nicely, for quick grab-n-go. Previously I couldn’t imagine doing neb treatment anywhere else than at home, but having it all together makes it easy to carry around, whether just to a different room in the home, or to the workplace, or when traveling. I have found that I need to do my breathing treatments first thing in the morning, before anything else. The moment I get distracted with other activities, it is unlikely to happen. Some mornings, I grab my box-bag and head off to work, doing it en route or when I arrive at work BEFORE I start on anything. On a side note, doing treatments is one of those weird paradoxes…even though it takes energy and time, I feel much better and more energised afterwards and have more productive days. Skipping the evening treatment causes a horrible wake-up situation in the mornings, so I do my evening routine before it gets too late and I might be tempted to skip it. So in addition to the long term benefits, there are short-term benefits too. I don’t know. Maybe everyone else has already figured this out and I’m late to the party. But this seemingly obvious solution has really helped me so I’d thought I share it. I don’t do the Vest because it’s not available where I live, so I just use airway clearance techniques along with the inhaled therapies. But I’d love to see a photo of your organising system (neb, vest or other) and hear your thoughts on compliance. A bit about me: I’m a 38 year old woman with Cystic Fibrosis. I have a blog and website about having a chronic illness and juggling life. “StyleComfy” is what want to be: On top of my game, in control of my destiny, with socks that match and my to-do list checked by 3pm. In reality, I mostly feel like I’m playing ping pong with three rackets while singing the alphabet backwards. Join me in the journey of Keeping it Together. Stuff I like: medical gadgets, napping, breathing, organising, having a career, colours, art and design. I also create printed items which can be bought in my online shop. Each design is available on several different items via Redbubble, so to see all items click a design in my portfolio at online store . I plan to create more CF-related designs soon…but current designs are in the shop or website linked above. Written by: stylecomfy on December 5, 2016. I love this organization system! I use a lot of Sterilite containers to store my ‘overflow’ of medications and a RASKOG cart from IKEA to hold my nebs and vest! The cart is especially handy since it is on wheels and I can be semi-mobile with it and make dinner or do dishes while I do my nebs and vest. Love the idea of the cart! Sometimes these things get heavy to carry around.